Reuben Keith Green began his military career in May, 1985 serving on the USS Voge at Mayport Naval Station. His last tour of duty was at the Jacksonville Naval Air Station where he retired in 1996 unhappy, feeling he received unfair and bias treatment throughout his Navy career. His 21 years of service led him to pen his autobiography, Black Officer, White Navy: Thriving While Black, and Sailing Second Class, in the Post Zumwalt Navy. He states his motivation was to, “provide guidance and experience to African American males wanting to enlist in the Navy.” The book recants Green’s tour on the Navy and the pressure of a white Navy on Black officer. For black history month Reuben Keith Green gifted African American men who were either in the military or had family in the military with a copy of his book at the offices of the Free Press. 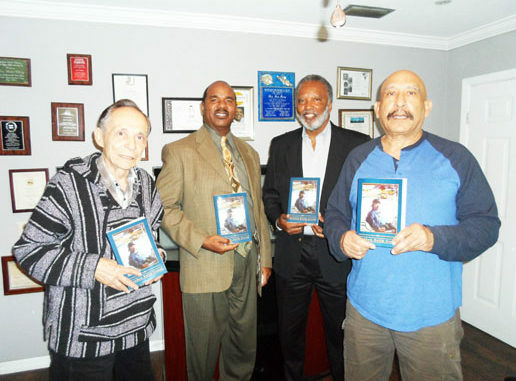 Shown receiving their signed copy l-r is R. Luis Negron, Naval Officer James Andrews, author Reuben Keith Green and Eddie Diamond.